Tioga County Tourism has experienced some big changes over the past year with the opening of the Tioga County Visitors Center in the new Gateway Building on Owego’s Historic Riverow. The new Visitor’s Center has a reception area, and visitor information on Tioga County, the Finger Lakes region, and New York State. Visitors and residents can stop in to learn more about fun things to do around the county, view a changing exhibition of local artwork, or relax on the deck overlooking the Susquehanna River. “We are looking forward to being ambassadors for all of our tourism partners,” said Rebecca Maffei, director, Tioga County Tourism. Maffei also explained that they are gearing up to start promoting events around the county. “Tioga County has so many fun events that allow visitors to experience all of the different aspects of life here,” she said. According to their online events calendar, things are happening in almost every community around the county. Some events coming up include the Tioga County Arts and Agriculture Trail in May, Owego’s First Friday monthly event, Daffodil Daze in Candor, and the opening day of harness racing, in conjunction with the Kentucky Derby, at Tioga Downs Casino Resort, located in Nichols, N.Y.
Summer events include the Newark Valley Summerfest, Candor’s Fourth of July, the Tioga County Fair, Sundaes at the Farm, the Summer Concert Series at Tioga Downs, and the Owego Strawberry Festival. The fall will be a great time to visit pumpkin farms, get lost in Stoughton Farm’s Corn Maze, and attend the Newark Valley Apple Festival at Bement-Billings Farmstead. The fun does not stop with the changing of the seasons, and events continue throughout the winter, with Lights on the River in Owego, Holiday Magic in Newark Valley, and Winterfest at Tioga Downs. 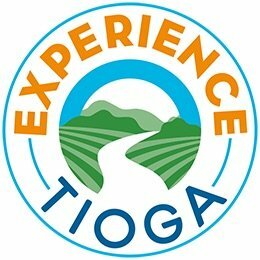 Currently, Tioga County Tourism is working on their annual brochure – Calendar of Events, and updating their website’s events calendar at www.experiencetioga.com. You can also find out more about what is happening around the county on their Facebook Page, Experience Tioga. “These are just a few of the events happening in 2019. There are many more concerts, performing arts shows, art events, and family-friendly festivals throughout the year,” said Maffei. You can submit your tourism event by contacting the Tioga County Tourism office at info@experiencetioga.com or by calling (607) 687-7440. You can also visit them at the new Gateway Building on Front Street in Owego. Be the first to comment on "Tioga County Tourism – A Gateway to area events and beyond"